Kate Daly, Executive Director of the Landmarks Preservation Commission. 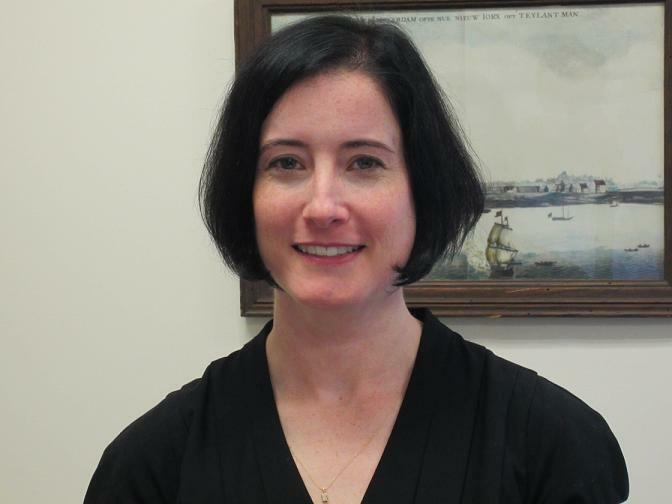 Kate Daly, the Landmarks Preservation Commission’s Executive Director oversees all of the agency’s operations, including its budget and personnel. She plays an important role in shepherding properties through the landmarking process, from the initial stages through designation. She is pivotal in the outreach process to communities and property owners, meeting with and educating people about the responsibilities and benefits of landmarking. Daly came to Landmarks in 2002 after completing her graduate degree in historic preservation from the University of Pennsylvania, where she wrote a thesis on the preservation of ruins at “sites of conscience,” including World War II internment camps, Pennsylvania’s Eastern State Penitentiary, and New York’s Tenement Museum. Daly earned an undergraduate degree in history from Cornell, which she followed with work in publishing and at human rights non-profits. She sought her graduate degree to better pursue a career related to her interest in history While studying at Penn she began in her professional career in preservation, working for the historic house trust, where she conducted surveys of historic buildings. A property owner often first becomes aware of Landmarks’ potential interest in designation through a letter from Daly. She strives to make owners aware of what might mean to own a landmarked building before the public process actually commence. She encourages owners to contact her individually. Daly states “it is my job to meet with an unenthusiastic owner and end the meeting with the feeling that there is someone at the agency who wants listen to them and is going to listen to the issues that they presented.” Property owners are sometimes surprised and concerned on learning of Landmarks’ interest in their building. She says there is a lot of inaccurate disinformation about the regulatory impact of landmarking, which she can help dispel. For an individual landmark that had been deemed eligible for entering Landmarks’ calendar, the outreach process begins with a letter to an individual or company, and inviting them to a meeting. The process is more complicated for potential historic districts, where the impetus for designation often comes from within the community, City Council members and other elected officials. Landmarks reviews proposals, works with community boards and elected officials in defining boundaries and hosts public information sessions. Meetings allow Landmarks to sense the neighborhood’s feelings about landmarking, and answer questions about the advantages or disadvantages of living in a landmarked neighborhood. In potential districts identified through department surveys, there is a much longer time between the initial contact and going before the commission. This gives community members time to meet with Landmark representatives and for Landmarks to address their concerns. Daly and other Landmarks representatives often face questions about the effect of Landmarks regulations. She says homeowners currently living in existing districts can be particularly effective in allaying concerns about regulations and the time and the requirements of modifications or renovations. Development pressures on neighborhoods are major concerns affecting conversations in the community. Where there has been little loss of historic architecture, residents often believe that the community can best protect its buildings without City oversight. Daly says she uses her academic training to help identify priorities about what types of historical architecture, time periods, and areas Landmarks should focus on. In general, she says her education gave her the ability to assist in those assessments of what is significant, and in gauging a property’s level of intactness and integrity. In term of accomplishments during her tenure, Daly says she like to think that the commission is perceived as being more responsive to the public. While she has been executive director, Landmarks created an outreach team that attends community board meetings and other events like the meetings homeowners’ associations, and also regularly talks to applicants, architects, and expeditors about the permit approval process. She expresses pride in how many historic district designations have taken place outside of Manhattan during her tenure. Asked to identify a landmark particularly near to her heart, Daly selected the American Bank Note Company Printing Plant, in The Hunts Point neighborhood of the Bronx, designated in 2008. It had been on Landmarks calendar for “many, many years,” with an owner uninterested in designation. It was designated after a new owner purchased the building with the intent of converting it to a new use. The owners undertook a high-quality restoration of the building, with Landmarks’ oversight, and the building is now home to retail and manufacturing uses, as well as a school. The commission Chair Robert B. Tierney pushed to identify and designate industrial architecture. Daly finds American Bank Note Company building a particularly compelling example of how the adaptive reuse of a historically significant building can “revitalize a neighborhood and contribute to a community” while protecting its historic fabric. Among the projects begun under her tenure she aspires to see to completion is the digitization of the Commission’s massive archives which would ease for both the public and Landmarks’ own staff. She also noted that the commission is in the middle of the designation process for numerous historic districts. Other ongoing issues include determining Landmarks role in the City’s sustainability and resiliency efforts. She says she expects Landmarks to address those issues more in the near future, and notes that she doesn’t see any conflict between historic preservation and sustainability initiatives, and that the two can work hand in hand. I realize that she may be working under her married name, but, curiosity moves me to ask Kate Daly if she is in any way related to Charles Patrick Daly, the great New York jurist, and his wife, the capable society doyen and author of “A Diary of A Union Lady,” Maria Lydig Daly. They did not have children, but they did have relatives, and an established tie to the Lydig clan along with the extensive Hoyt family.